: Cypress Place at Nicklaus North Show Home Grand Opening on Saturday, April 21st, 12-4 pm! A West Coast Mountain Contemporary home designed by local architect Brigitte Loranger features interior design by Vancouver based Maza Interior Design. Drop by for a tour of this amazing home, and to meet our Team, on Saturday between 12-4pm. Address: 8000 Cypress Place in Whistler, BC (first house on the right as you enter the Cypress Place neighbourhood). The show home has many sustainable elements such as geothermal heating and cooling, triple pane windows, energy saving lighting and temperature control systems, and water conserving plumbing fixtures – just to name a few. With a unique design concept this 5 bedroom, 5 bathroom golf course view home is largely livable all on one level; with master and ensuite, kitchen, dining, living spaces, den, media room, and guest bedroom all on the main floor. The second level features an additional two spacious bedrooms with ensuites. The design incorporates grand two-storey ceilings animated by soaring Douglas Fir heavy timber beams, rafters and wood decking sourced from local mills in BC within a 500 km radius of the site. 39 single family home sites situated on a private cul-de-sac on the 5th hole of Nicklaus North Golf Course in Whistler, BC. Development by the Burrard Group. 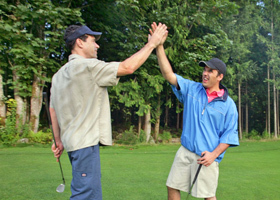 Nicklaus North Golf Course is owned & operated by GolfBC, a division of the Burrard Group.